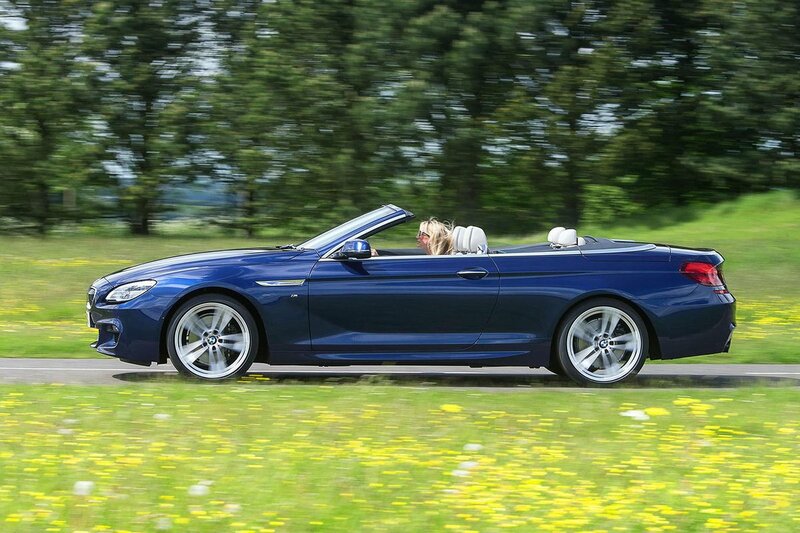 BMW 6 Series Convertible Performance, Engine, Ride, Handling | What Car? 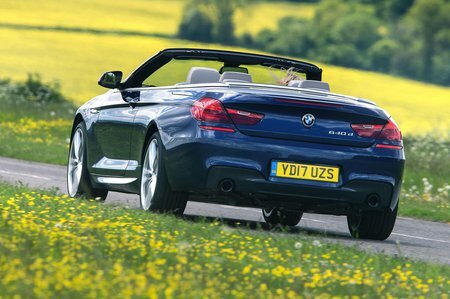 The 6 Series Convertible is pitched as BMW’s long-legged grand tourer and therefore has a brace of engines to suit. Kicking off the range are a pair of turbocharged six-cylinder models, a diesel badged 640d and a petrol that wears the 640i nametag. Both manage 0-62mph in 5.5sec; although the petrol is a bit more powerful, it’s the diesel that offers more effortless performance, thanks to its superior low-down grunt. Next up is the 650i with its twin turbocharged 4.4-litre V8. This smooth 444bhp lump cuts the 0-62mph time to just 4.6sec and gives the 6 Series real continent-crushing pace – if you don’t mind stopping for fuel, that is. However, if that still isn’t quick enough for you, then the M6 has a heavily worked-over version of the same V8 with 552bhp or 592bhp if you opt for the Competition Package. 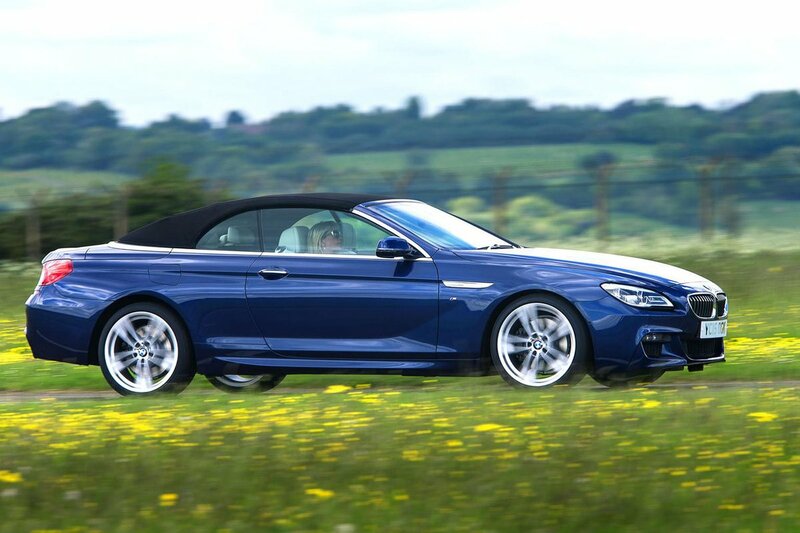 The ‘regular’ M6 scorches to 62mph in 4.3sec, while the Competition model manages a stunning 4.0sec. The 640 and 650 engines come as standard with BMW’s eight-speed automatic gearbox that shifts almost imperceptibly between ratios. M6 models get a racier seven-speed 'box that isn’t as smooth but is much more responsive in manual mode. Although the M6’s thumping performance might appeal, it’s worth remembering that no 6 Series is what you’d call a sports car. There’s certainly plenty of grip and you can cover ground very quickly, but you’re always aware of the car’s hefty weight and slightly numb steering. We’d advise sticking to the 640d because it’s more than quick enough and very refined, and it will prove the cheapest to run by far. Our experience also suggests opting for the Variable Damper Control (VDC) will give the most comfortable ride, as will the 18in wheels of SE-spec cars. Bigger wheels not only make the ride harsher, they also make road noise noticeably louder. With that in mind, we’d avoid M Sport trim. Whichever combination you go for, the 6 Series is at its best cruising at speed. With VDC set to Comfort+, it’ll waft along motorways and A-roads with ease. Slow down and you do notice urban ruts causing some disturbance, but the suspension rarely crashes.